The French comedian at the centre of the Nicolas Anelka racism row has been banned from entering the UK, the Home Office has said. 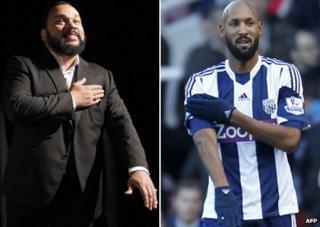 Dieudonne M'bala M'bala had said he would visit the West Bromwich Albion striker, who faces a ban for performing the comic's "quenelle" gesture. The "quenelle" is considered by some to be anti-Semitic. The Home Office said it banned individuals if there were "public policy or public security reasons". Anelka, 34, has been charged by the FA for performing the gesture after scoring against West Ham United in December. He faces a minimum five-match ban if found guilty of an "abusive" sign. However, the striker denies the FA charge and has requested a personal hearing. The "quenelle" involves touching or gripping your shoulder with one hand while holding the palm of your other hand outstretched and pointing to the ground. Some describe it as a combination of the bras d'honneur with a bent arm (which means "up yours") and the Nazi salute. Anelka claimed his action was designed purely as a show of support for Dieudonne and suggested the salute could be perceived as "anti-establishment", rather than discriminatory. Dieudonne has been convicted six times of hate speech against Jews. Last week French media reported that police raided properties linked to him as part of a fraud inquiry. Several of his shows were banned in France last month amid fears his portrayal of Jews and mocking of the Holocaust were a risk to public order. He rewrote the shows, dropping much of the material deemed offensive, but fans and civil liberties campaigners accused the French government of censorship and attacking free speech. Interior Minister Manuel Valls wants Dieudonne kept off all stages in France, condemning the comic's "mechanics of hate". A spokeswoman for the Home Office said: "We can confirm that Mr Dieudonne is subject to an exclusion order. "The Home Secretary will seek to exclude an individual from the UK if she considers that there are public policy or public security reasons to do so." Anelka said last week that he would not walk out on West Brom despite the FA charge and possible ban hanging over him. The striker has insisted that he is "neither anti-Semitic nor racist". The club, which is in the midst of a relegation battle, has said it will keep the former Arsenal and Real Madrid player available for selection until the hearing, but has asked him not to repeat the celebration. Anelka was charged by the FA with making a gesture that was "abusive and/or indecent and/or insulting and/or improper". The FA added that it was "an aggravated breach in that it included a reference to ethnic origin and/or race and/or religion or belief". Who, What, Why: What is the quenelle gesture?